The Karnali is arguably the finest multi-day river trip in Nepal, and a classic Himalayan expedition. The Karnali's headwaters come off Mount Kailas in Tibet, the centre of the universe for both Buddhist and Hindu religions, slicing through the Himalayas in a series of magnificent isolated gorges and forests. In terms of volume, the river is comparable to the Sun Kosi, but being constrained by canyon walls the Karnali is forced to give a bigger, more continuous presence. This increase in velocity has an exaggerated effect producing some serious rapids. 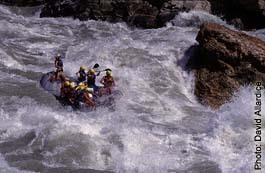 Quoted as being one of the finest rafting rivers in the world, it is also an incredible journey for the advanced kayaker who is happy on big water. After breakfast we head to the airport for an hour long flight to Napalgang, taking in the amazing Himalayan views along the way. Its then a bus ride and short trek to the river where we raft up and float downstream to our overnight camp. The first few days of the river has us running big continuous whitewater. One such day begins with the well known Gods House rapid with us then continuing in a series of canyons for about seven kilometres and 16 odd rapids. The latter part of the river mellows out and allows us to enjoy the amazing scenery and solitude of the river deep in the jungles of Western Nepal. Drifting down from the last camp we come to Chisopani where we pack away the rafts and head for the airport at Nepalgang for a flight back to Kathmandu. Price includes: Transfers to/from Kathmandu Airport, all accommodation, all meals, all equipment, internal flights, guides. Excludes: personal insurance, personal drinks (soft drinks, beer etc. ), tips, international flight, pre/post trip meals in Kathmandu.